Disappointment is always worse when it's an author you really like. I've read the Ruby Oliver books. I know E. Lockhart can do better than this. Here's your short review of the story. If you don't want nitpicking, you can move along now. I didn't know this was a highly anticipated release. I didn't even know there was a major twist in the end I had to look out for. (Blogging hiatuses are good in that respect.) But then, the blurb at the back of my copy was pretty vague, too. It seems like the best thing, for readers to go in blind, although I'm not entirely sure the book delivers on what it has promised. Raised in the affluent and beautiful Sinclair family, Cadence has, in theory, the perfect life. In reality, she's sick and forgetful, suffering from terrible headaches and gaps of memory, all due to an accident she suffered at 15 at her family's private island. She returns to the island, nearly 18, to try and piece together the story of what happened to her, and realizes it's part of a much bigger tragedy. I won't spoil the ending for you. Really, the twist isn't my beef - I actually liked the twist. It makes for an interesting re-read, a sort of spot-the-clues challenge that guarantees to have the reader coming back for more. And, really, the ending helps one make sense of some of the more WTF moments this book has. 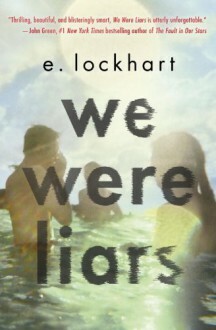 "We Were Liars" reminds me of a TV show I once watched. It was also about an affluent family living in their own privileged little world, and it also had one of the teens uncovering a grisly secret. But the show was based in a city, not an isolated island, and the characters actually interacted with people who were not part of their giant game of make-believe. Which I think made it a stronger story. The reason why I chose "We Were Liars" is because it promised a story about a family torn apart by its own bigotry and its isolationism. And it delivers on those fronts - Cadence's grandfather, Harris, controls his adult daughters and grandchildren by dangling their inheritance over their heads and constantly making them fight each other to make sure they get their fair share. Cadence and her cousins Mirren and Johnny, as the eldest kids, are continuously brought into the game, used a pawns by their mothers and their grandfather, and the resulting tensions take a toll on everybody. The only outsider in this "white, white" family is Gat - the nephew of one of the aunt's boyfriends, he's best friends with Johnny and Cadence's forbidden romance for this book. Half-Indian, Gat is only tolerated by the older members of the family, and his uncle's romance with Cadence's aunt is constantly marred by the fear of disinheritance. So far, so good - there's proper intrigue and the stakes are high. I didn't even mind the fact that Cadence had this whole "poor little rich girl" thing going on - I thought that it was a character trait that would be explored later in the novel. Plus, she is legitimately disabled, and her disability is portrayed in a realistic manner. Unfortunately (and it pains me to say it) what I really didn't like about this novel is that... well... it's just not gruesome enough. It's not messy. There is a mystery and Cadence slowly uncovers small clues on the island as she goes about her day, and interacts with people, but it feels... clean. Sterile. White. The island is a bubble where literally no bad things happen, and the threat that is present at the fist pages of the book loses its bite pretty soon. And given the subject matter, it makes me scratch my head. Where are the dramatic confrontations? Where is the resentment? Where is the guilt? After the twist, there are only a handful of pages left - barely enough for Cadence to reconcile herself with this new shift in her reality, let alone come to terms with it. It's just all too neat for my liking, and it pisses me off because I know E. Lockhart can do better than that. One might say this was a stylistic decision, but if you're going to be making your story all isolated and sterile, your narrator has to be pretty compelling. And Cadence, I'm afraid, is a robot. I'm not saying "robot" as in "too perfect to exist," because there is no doubt she is a flawed person. I said on BookLikes that this reminds me of a Wachowskis movie, and not in a good way, and I stand by my statement - Cadence's narration relies heavily on metaphors and stock phrases, but delivers very little on meaning. Comparing it to the Ruby Oliver books, where I could feel the MC's frustration and anger from a mile away, Cadence is flat. I don't get anything from her. Even her interactions with Gat, whom she purports to love, come across as flat and boring. Where's the passion? Seriously? Where is it? Like I said, I'm not going to spoil the book for the rest of you, but I'm overall disappointed by the delivery. Note the Second: I'm running to rise funds for a young people's mental health charity. To contribute, or just spread the word, please follow this link. Did you know you can create short links with AdFly and make cash for every visitor to your short links.